A man who escaped from a Hawaii psychiatric hospital where he has been held for nearly four decades told a television station he did it to prove that he is capable of living in the outside world. Randall Saito, who authorities warned should be considered dangerous after he escaped from a Honolulu area psychiatric hospital, said he had $7,000 for his escape but would not say where he got the money or if anyone helped him in a jailhouse interview with NBC affiliate KCRA of Sacramento. 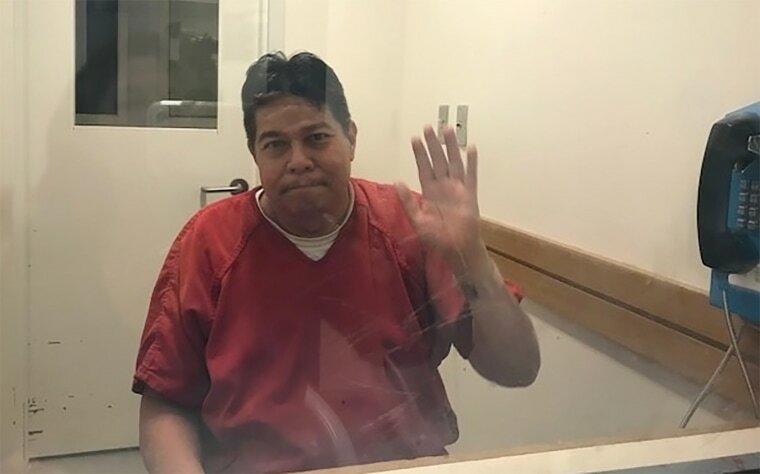 Satio, 59 — who was acquitted in the 1979 killing of Sandra Yamashiro by reason of insanity and in 1981 was committed to the Hawaii State Hospital in Kaneohe — was captured in California on Wednesday without incident, officials said. "They won't give me a chance. They're not going to release me," Saito told KCRA. "And once I kind of understood that, I kind of figured, well, if anything's going to happen, it's going to happen with me. I'm going to have to do something pretty risky and gutsy to prove to these guys that I can handle myself in the community." Saito left the hospital at 10 a.m. (3 p.m. ET) Sunday and did not return, police said. He took a taxi from Kaneohe to Honolulu, then boarded a charter plane to Maui and from there boarded a plane to San Jose, California, police said. Hospital staff did not call 911 to report the escape until shortly after 7:30 p.m. local time Sunday, police said. By that time, Saito was already in San Jose, having landed there at around 5:30 p.m. Hawaii time, according to police. The escape prompted calls for a review and changes by Hawaii's governor. “We’ve already relieved those personnel that we believed were on duty at that time,” without pay pending an investigation, Gov. David Ige said at a press conference. Security, fencing and patient privileges are being reviewed, he said. Hawaii Department of Health Director Virginia Pressler said an investigation is underway, and that the escape was a major breakdown of staff protocols. Seven hospital staff members are being placed on unpaid off-duty status, and more may be taken off duty, the Department of Health said in a statement Wednesday. Court records say Saito had relationships with three hospital staff members over the years, the Associated Press reported. Saito was apprehended in San Joaquin County in California on Wednesday after an alert taxi driver gave the sheriff’s office that the driver had Saito in their car, a public information officer of the sheriff’s department said. Deputies pulled the vehicle over and arrested Saito without incident, the official said. The Hawaii Attorney General’s Office said it is conducting an investigation into procedures and who if anyone helped Saito escape. Yamashiro was shot and repeatedly stabbed before her body was found in her car at a mall. Saito told KCRA in the California jail interview that he was on drugs when she was killed and "I actually snapped that night." "I regret it every day. I pray for her every day. I believe the family I offended has the right to take my life but no one else. I owe them something I cannot repay," Sato said.